COLUMBUS, INDIANA – Cummins Inc. (NYSE: CMI) and Hyundai Construction Equipment (HCE) announced today they have jointly developed an electric powered mini excavator. "As electric vehicles continue to expand their share in the automotive market, we are simultaneously seeing the electrification of commercial power systems being pursued by many as both an environmentally friendly and economically sustainable solution for construction equipment," said D. S. Kim, HCE Senior Executive Vice President & CTO. 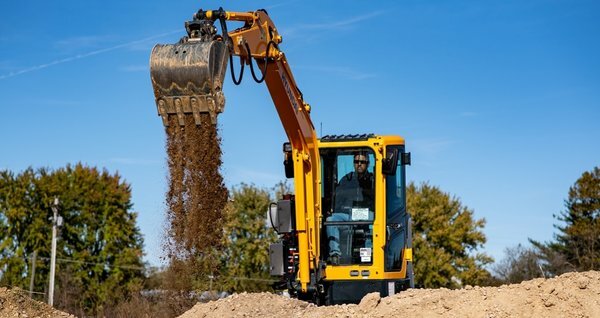 "HCE anticipates mini excavators, which operate in urban workplaces close to residential areas, will be a prime candidate to electrify to meet zero-emission and low noise requirements in the near future." Based on the long-term productive partnership of the companies, HCE and Cummins agreed to collaborate on the design and development of electric powered mini excavators for this market. Powered by Cummins *BM4.4E flexible battery modules (4.4 kWh each), the 3.5-ton excavator is designed to operate for a full eight-hour shift and charge in under three hours. The machine eliminates all gaseous emissions and substantially reduces noise, making it ideal for use in urban and sub-urban construction. As urban cities around the world expand zero-emissions standards for transit vehicles to also include small and medium construction equipment, our customers are seeking electrified products in this space that match or exceed the reliability and performance of their diesel counterparts. The prototype machine will be used for testing to optimize the performance, prove the structural integrity and enhance the marketability. *About the BM4.4E: The excavator contains eight BM4.4E modules connected together in a series string to provide a total energy of 35.2 kWh. Mounted in the base of the excavator, the Cummins-designed and built Battery Modules utilize Li-ion technology to achieve a higher energy density and proprietary control technology to maintain the battery state-of-charge for a longer zero emission range. The modular design allows the system to be built up and aligned to the duty cycle of the excavator. Established as a Heavy Machines Division within the Hyundai Heavy Industries Co., Ltd., HCE produces and sells construction equipment such as excavators and wheel loaders, as well as industrial vehicles such as forklift, tow and transport vehicles. HCE’s factories produce 50,000 units of construction equipment and industrial vehicles on a yearly basis. Its sales revenue goal for 2018 is set at KRW 3.28 trillion. For the past 30 years, the company has spread its distribution channel through 540 dealer networks in 140 countries. For more information, visit www.hyundai-ce.com.